Image: Kostagr/Shutterstock. Design: Ashley Britton/SheKnows. Looking for a bustling, sprawling, ancient city that’s too often overlooked by families on vacation? Sounds like it’s time for you to visit Athens with your kids. Greece itself is more famous for its island-hopping between pristine beaches and crystal-clear blue waters — well, that and adorable Greek baby names. But this city is not to be missed, especially with your little ones in tow. Greeks love kids, and even though it’s a big city (roughly five million people), Athens is surprisingly very safe, entertaining, and full of ancient and modern wonders all ages will enjoy. Here are the best spots in the city if you’re traveling with kids. Image: Courtesy of The Happy Train. Most tourists visiting Athens only stay for a day or two, but this is a big mistake because the city has so much to offer. 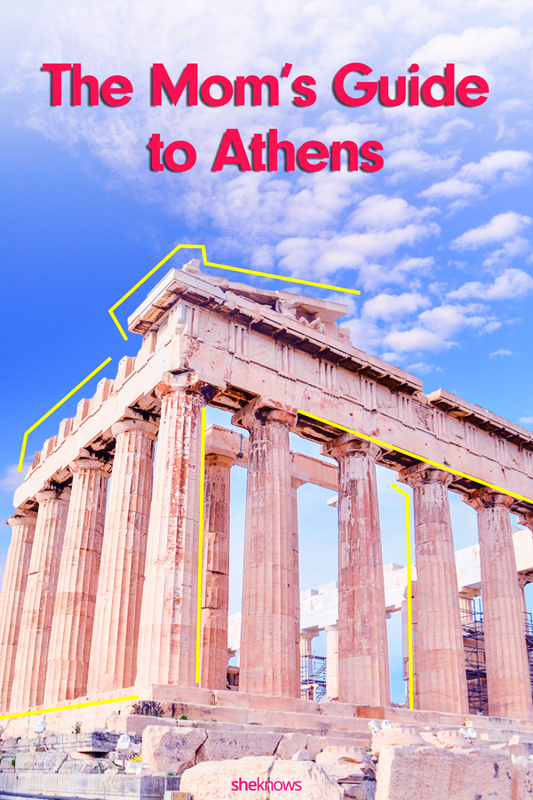 The best sightseeing area and starting point is of course the historical center of the city, the Acropolis and Plaka, filled with ancient history, souvenir shops, places to eat and lively people-watching. Your little ones will love running through the small narrow streets, eating ice cream on every corner and reveling in summertime evenings either at an outdoor theater or in the many “plateias,” or squares, in this area. The Happy Train is a fun and easy way for you to get around with your little ones to all the most famous historical sites of Athens. The tour lasts 40 minutes, although you can hop on and off as you like, extending the tour to the whole day. It runs year-round and is especially fun for younger kids. Visiting the Acropolis is a once-in-a-lifetime opportunity. 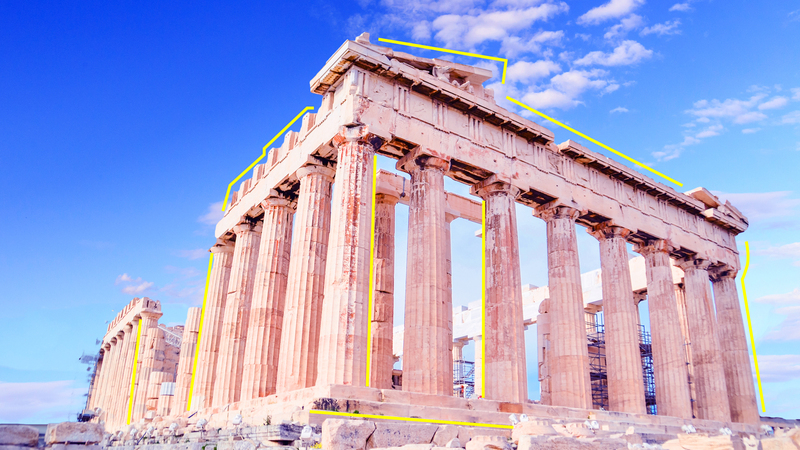 Tweens and teens will appreciate the beauty and the awe-inspiring architecture of the ancient Parthenon. There are amazing views of the city, and just being there will spark conversation and curiosity in any child. Make sure everyone wears proper shoes, though, as the ancient site can be very slippery at times. Also, avoid visiting during the midday heat in the summer. The best times to go are early morning or early evening. Image: Courtesy of Allou Fun Park. If you have longer than a day or two and your children are fed up with history, head over to Allou Fun Park. It definitely isn’t Disney, but it will keep your kiddos entertained for a few hours and it is so much fun. There are two parks — one for teenagers/adults and another for smaller children — with a slew of rides and games and food. And if you want to make a full-day excursion out of the city center, pair the Allou Fun Park with visiting Village Cinemas, which is a shopping center and cineplex in one. On the rare occasion the weather is bad, perhaps during the winter months, a must-visit is the Eugenides Foundation Planetarium. It’s one of the biggest digital planetariums in the world and is super high-tech in the best way. Remember to bring your own earphones to get English commentary (and avoid having to buy them there). It’s probably not ideal to bring tiny infants here, but older kids will love it. Image courtesy of Visit Greece. For a day of fun in the sun, head south to the Athens Riveria, with plenty of serviced beaches to choose from that are easily accessible. In the furthermost suburb of Varkiza is Yabankaki beach, which is equipped with everything you need for a day at the seaside — including sunbeds, water sports, child–friendly shallow waters and restaurants. There’s no shortage of great food in Athens, and “kid-friendly” places are basically everywhere; no establishment is going to give you the side-eye for bringing your kids (perhaps with the exception of a few Michelin-star restaurants). Greeks love kids, and they let them run freely during mealtimes. Souvlaki or shish kebabs are abundant, and there are plenty of places that sell these delectable pita sandwiches all day and all night. You can select the type of meat and customize your toppings for a crowd-pleaser for all ages. We visited En Athines Alexandra, which had exceptional souvlaki and an array of tasty grilled meats, Greek salad and excellent french fries. The kids loved it — even our 14-month-old baby. The restaurant is small, however, so you might prefer to get your order as take-out to bring back to your rental or hotel room. Veneti Fournos is a chain bakery found all over Athens. It’s a great place to stop in for a pita, or hand pie (try the spanikopita, ham and cheese, or just cheese). You’ll also find plenty of delectable bread, baklava, cookies, and even ice cream. Try the “Peinirli,” a yummy boat-shaped Greek pizza. There are so many bakeries, and most have the same offerings — so don’t be afraid to try whichever is nearest to you. If your kids are into burgers or fast food in general, then go to Goodys. It offers not only burgers but pasta, chicken and the ever-popular club sandwich. It’s a great place to eat if you’re in a hurry (but it definitely won’t be the best food you can have in Greece). Image Courtesy of Erato Restaurant. 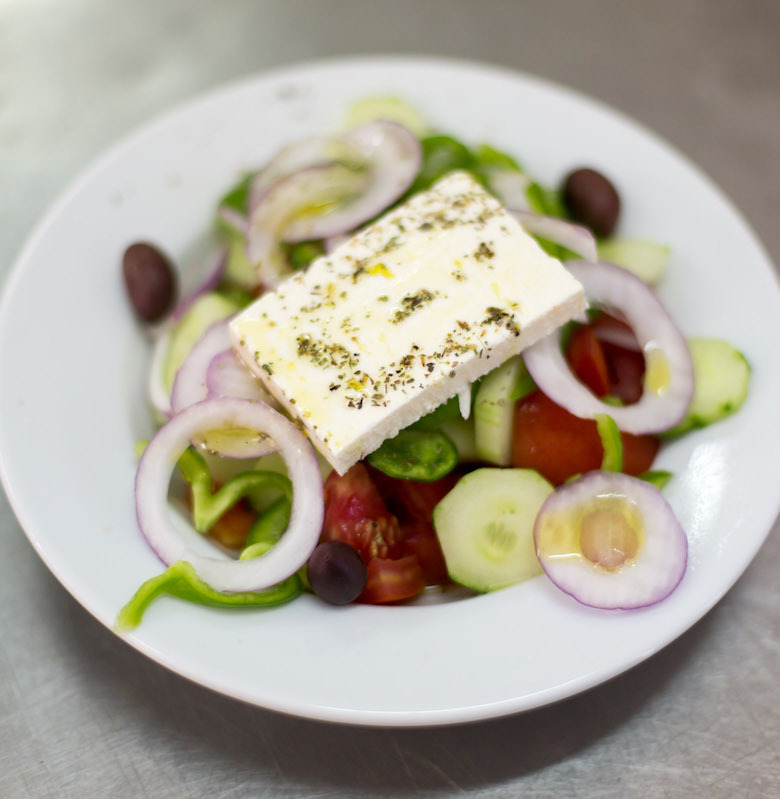 For traditional Greek dishes, you will need to go to a taverna. These restaurants are typically open in the afternoon — and again in the evening at about 8pm. Here, you’ll find moussaka (eggplant lasagna), gemista (stuffed peppers and tomatoes), grilled meats and fish. We loved Erato Restaurant, located in the heart of Plaka. This taverna was simple, right off the tourist shopping path, and had amazing food. They were so great to our kids, and even brought out special food items for them to try — a wonderful selection of typical Greek food along with mouth-watering seafood and grilled meats. Image courtesy of Divani Hotel. Athens is a city that boasts a wide range of child-friendly hotels. 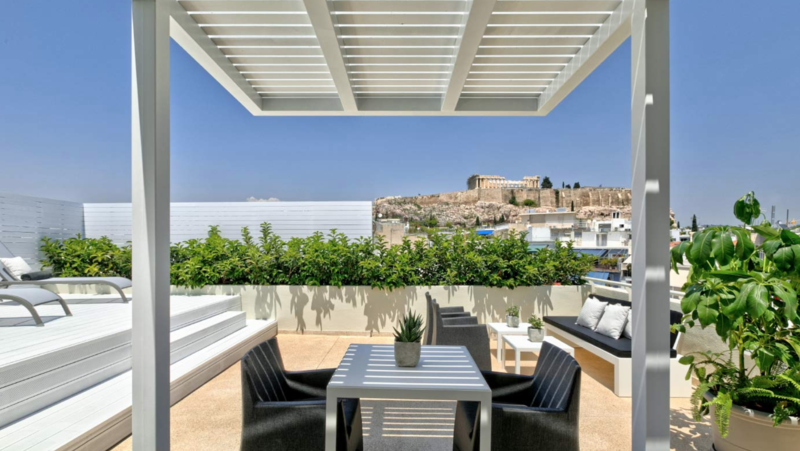 However, the vacation home rental market is one of the best — and you can find some really amazing properties at affordable prices for your stay, some of which are in the foothills of the Acropolis with stunning views of the Parthenon from the rooftops. If you are looking for a hotel — especially one with a pool — in the historic center, check out the Hilton or Divani Hotel in Plaka. As far as which areas to stay in, the center is typically the easiest for getting around; Plaka, Thesio, Koukani or Koloniki are all ideal. 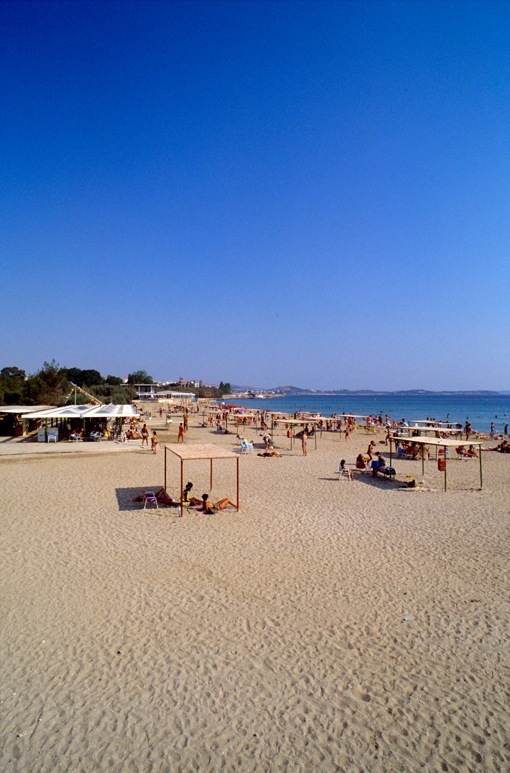 If you want a little more beach time, try Glyfada, Voula or Varkiza in the south.